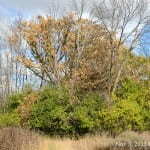 In the area around the City of Green Bay many trees have lost all or most of their leaves, especially the commonest and most abundant species such as green ash (Fraxinus pennsylvanica), box elder (Acer negundo), and cottonwood (Populus deltoides). 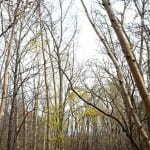 Other species generally leafless now include: white birch (Betula papyrifera), quaking aspen (Populus tremuloides), and wild cherries (Prunus serotina and Prunus virginiana). Species still holding leaves include the invasive buckthorns (Rhamnus cathartica and Frangula alnus), Norway maple (Acer platanoides) and to a lesser degree silver maple (Acer saccharinum). The oaks also tend to hang onto their leaves, even after they turn brown (see Nov. 4). The photo at left shows still-green leaves of European buckthorn under the mostly bare branches of other species. If you look carefully, you may also notice green leaves still on the branches of a crack willow (Salix fragilis, another alien species) behind the other trees, toward the right side. 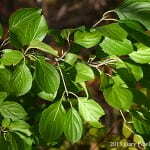 Close-up of leaves of European Buckthorn (Rhamnus cathartica). European Buckthorn remains green late into Autumn. 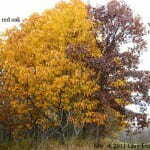 Oaks proovide late season color. Most trees are now bare of leaves.